Australian Open, one of the first Grand Slam tennis tournaments of the world, was held for the first time in 1905 in the Warehouseman's Cricket House in Melbourne. It is the first grand slam to be held every year as the championship takes place in the month of January. 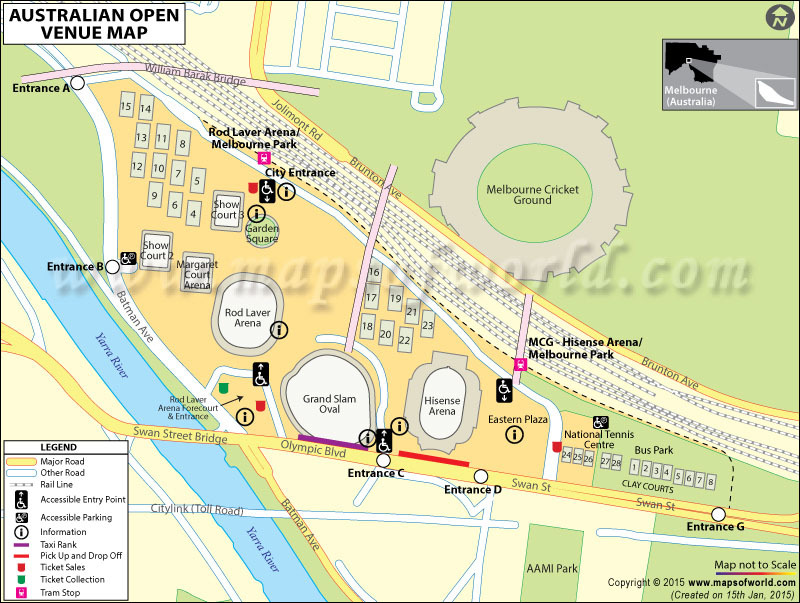 Though the tournament was originally a grass court one, yet it shifted to a hard court at the Flinders Park, currently called the Melbourne Park, in the year 1988. The tournament has five sections- the men's singles and doubles championship, championship for women in singles as well asdoubles category and also a mixed doubles competition. The tournament also boasts of sections for the junior tennis players and the retired tennis greats. The tournament which started as the Australasian Championship in 1905 and took the form of Australian Championship in 1927 was changed to Australian Open in the year 1968 with the advent of open tennis. The two courts mainly used in the tournament are the Rod Laver Arena and the Vodafone Arena, both of which have movable roofs to use according to the weather. Some of the significant names among the champions in the men's section are Jimmy Connors, Stefan Edberg, Ivan Lendl, Boris Becker, Pete Sampras, Andre Agassi and Roger Federer. Martina Navratilova, Steffi Graf, Monica Seles, Serena Williams and Jeniffer Capriati have been among the greats of women's tennis who have experienced the feelings of winning the Australian Open. The men's and women's doubles category of the tournament have seen a number of famous pairs as the champions. Australian Open is among the four most coveted tournaments of the year. It attracts a large number of spectators every year and the tournament is sure to take one of the major places among the ATP tours very soon.